Do you spend the majority of your wakeful hours sitting at a desk staring at a computer screen? If so, then you’re not alone. In the blink of an eye from an evolutionary perspective we’ve gone from living as physically active hunter-gatherers in the wild to spending our days sitting in comfortable chairs inside large apartment complexes and office buildings. The health implications of this disconnect from our original, ancestral habitat are profound, and there’s little doubt that taking some steps to reconnect with nature – such as by going for a daily walk in the park or getting out in nature during the weekends – is high on the list of things we can do to enhance our health and mental well-being. Ever since the Agricultural Revolution approximately 11.000 years ago, humans have experienced a progressive loss of contact with natural environments. Today, staring at a desktop background of a natural landscape has become the closest thing some people get to an interaction with nature. Man seems to be adapting to the ugliness of smoky skies, polluted streams, and anonymous buildings; to life without the fragrance of flowers, the song of birds, and other pleasurable stimuli from nature. This adaptation, however, is only superficial, and destructive in the long run. Air, water, earth, fire, the subtle forces of the cosmos, the natural rhythms and diversity of life have shaped man’s nature during the evolutionary past and have created deep-rooted sensual and emotional needs that cannot be eradicated. The impoverishment of sensual and emotional life will progressively result in the atrophy of our uniquely human attributes. Studies of contemporary hunter-gatherer societies, examination of fossils, and genetic analyses have given us a lot of insight into the way of life of Paleolithic humans. But there’s still a lot we can’t say for certain – hence the debate and controversy surrounding exactly how pregricultural people ate and lived. However, if there’s one thing we know for sure, it’s that our Paleolithic ancestors moved their bodies a lot! When you live in an ancestral, natural environment, where private transportation, chairs, TVs , and computers are nowhere to be found and you have to hunter and gather for food, you simply can’t avoid spending a lot of energy on physical activities such as running, walking, and carrying of food and materials back to camp. 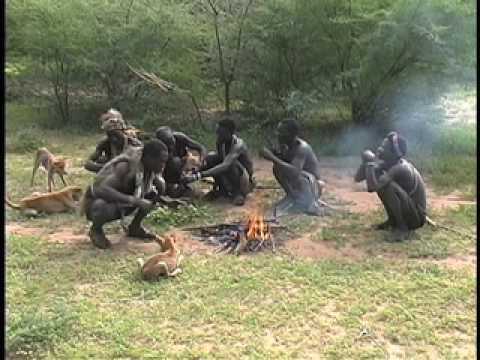 Estimates suggest that hunter-gatherers typically cover about 6 to 16 kilometers every day as they hunt and gather for food and otherwise do the things that are required to survive (2, 3). Perhaps needless to say, this is a lot more than most modern humans. Up until very recently, hours of daily low-intensity activities, such as working on a farm, walking long distances to and from work, and working upright in a factory all day, were a demanded part of the daily life of pretty much everyone. As we know, this has dramatically changed over the last several decades, as more and more people use cars to get where they need to go, have sedentary office jobs, and communicate with other people through phone, e-mail, and social media sites. We’re spending more time sitting and less time walking and standing than ever before, a transition that has had a profound impact on our health. From an evolutionary perspective it makes sense that so many of us find it hard to get off the couch and into the gym. For our ancient ancestors, physical activity wasn’t a choice, but rather a demanded part of daily life. Expending more energy than what was necessary to acquire food, build shelter, etc. would just make it harder to “make it” in an ancestral milieu where food wasn’t conveniently found at a grocery store nearby. In other words, it’s easy to understand why we evolved a tendency to take it easy and relax when possible. Those who regularly perform relatively high-intensity activities such as running and weight lifting might not classify walking as actual exercise. After all, a walk in the park is a very different form of physical activity than a 1 RM deadlift or an all-out sprint on the treadmill. When I was a young gym junkie, I was guilty of neglecting the importance of non-exercise activities such as walking to work, typing, performing yard work, undertaking agricultural tasks, and fidgeting. I didn’t really look at the activities I performed outside of the gym as having any real impact, and walking, the most common weight-bearing exercise, was nothing more than a chore to me – something that had to be done in order to get from A to B. In retrospect, I clearly realise how flawed this way of thinking is. This focus on workout sessions and the neglection of low-level activities performed during the day also stretches out into the rest of our society. It seems that many of us believe that a 30-60-minute workout session will largely make up for an entire day of sitting; first in the car on the way to work, then at a chair in front of a computer during the day, and finally in the couch at night. We believe we’re physically active since we exercise 3-4 times a week, but in reality, we’re spending very little time actually moving our bodies. This is worrying, as “accumulating evidence suggests that, independent of physical activity levels, sedentary behaviours are associated with increased rick of cardio-metabolic disease, all-cause mortality, and a variety of physiological and psychological problems” (4). In other words, you shouldn’t expect the 30 minutes you spend on the treadmill after work to “erase” the damage that has accumulated from hours of sitting. Because sitting for prolonged periods every day compromises metabolic and cardiovascular health and increases the risk of developing lower back pain, upper crossed syndrome (“desk man hunch“), tight hip flexors, excessive anterior pelvic tilt, atrophied glutes, and many other problems related to the musculoskeletal system, the health problems associated with excessive sitting becomes especially apparent when you work as a personal trainer/coach and see clients who lead sedentary lifestyles on a daily basis. If you take a look at the people around you the next time you’re at the gym or out on the street walking, you’ll quickly see that these conditions, which are manifestations of a mismatch between our ancient physiology and a modern, sedentary lifestyle, are extremely common. Given what we know about the negative health effects of sitting for prolonged periods day in and day out, it doesn’t come as a surprise that being more physically active throughout the day – even if it’s just a matter of breaking up sedentary time with small walks – can help boost our health. A recent systematic review and meta-analysis of randomized controlled trials found that walking interventions improve many risk factors for cardiovascular disease, including aerobic capacity, systolic and diastolic blood pressure, waist circumference, weight, percentage body fat, and body mass index (5). Regular dynamic aerobic exercise, such as brisk walking at 60-70%+ of maximal heart rate, develops and sustains physical fitness, aids in the prevention of chronic disease and postural problems, helps us maintain flexibility, strengthens muscles and bones of the legs, limb girdle, and lower trunk, and enhances several bodily processes that are inherent in skeletal muscle (5, 6). Walking can also play a supporting role in weight management, largely by inducing greater energy turnover and improving metabolic health (6, 7). It’s also important to remember that exercise isn’t just about improving our physical health and enhancing our protection against chronic disease, but also about having fun, getting outside, and playing. The social, pleasurable, and psychological dimensions of walking are definitely important in that regard. While doing more low-intensity physical activities in general is a good thing – regardless of whether it’s a session on the rowing machine at the gym, a walk to and from work, or a weekend hike, there’s little doubt that the best option – particularly if you’re looking to enhance your brain function and mental health – is to perform your activities in a natural environment. As highlighted in the quote in the beginning of this post, the progressive loss of contact with natural environments that accompanies industrialization and urbanization is associated with wide-range of negative health effects, many of which are related to our mood and happiness. Among other things, a loss of contact with natural environments has been linked with increased rates of depression, anxiety, behavioral disorders, and diminished quality of life (1). Recent studies that have compared the mental health effects of walking in nature vs. an urban environment found that individuals who walked in a natural environment experienced increased working memory performance and lower levels of anxiety and rumination (repetitive thought focused on negative aspects of the self) when compared with those who walked through an urban environment (8, 9). Moreover, walking in the leafy, quit area led to reduced neural activity in an area of the brain linked to risk for mental illness (9). So, how can we transfer all of this into some practical recommendations? The main takeaway is that we can all benefit from spending more time in nature and being more physically active throughout the day. Although going to the gym for 1 hour after work helps you maintain a strong and healthy body, it doesn’t zero out the adverse effects of 10 hours of sitting indoors in front of a computer. There are many ways to get more physical activity into your daily life, such as buying a treadmill desk, breaking up sedentary time with small walks, and making a habit of going for a walk in the park on a regular basis. Deteriorating air quality due to traffic fumes is a big problem some places, so if you can, perform your walks in green areas that are not highly polluted. While some form of running, sprinting, and strength training should be a part of the exercise routine of everyone who are serious about achieving good physical fitness, choosing these activities isn’t always an option. Walking, preferably at a relatively high intensity, is safe, convenient, and requires no special equipment or skills, and can serve as a gentle start-up for the sedentary, elderly, and frail. If you’re a person who is currently very inactive, even a 20-30-minute brisk walk 2-3 times a week can make a noticeable difference to your health – and it might just be the thing that gets you further motivated to go for regular hikes in nature and/or do more strenuous activities such as strength training and sprinting. Walking is a habit-forming activity, and if there’s one thing the literature on physical activity, diet, and fitness consistently shows, it’s that getting into good habits is extremely important. Personally, I try to walk for at least 1 hour every day. Since I currently live in a big city, I don’t get to go for a walk in an “untouched” natural environment every day. Rather, like most other city dwellers, I have to settle for the local park/green space. What about you? Do you primarily move your body when you’re at the gym, or do you also put an emphasis on performing some of your physical activities outside in natural environments? Picture: Creative Commons picture by Garry Knight. Some rights reserved. I walk my dogs almost every day (30-minutes or longer) in nature on a trail by my house (lots of deer and turkeys hang around the area), and sometimes on weekends I am able to read outside on the patio (fresh air and sunlight). I have a standing workstation so I stand most of the day, and I take a couple breaks during the day but still most of my day is spent inside staring at a computer screen. I have a sunroof in my car which I almost always leave open so I can get more sun and fresh air during my 45-min commute. My morning workouts are done inside before work (strength, stretch, cardio [steady state and HiiT and Plyo]). That’s the best I can do. 🙂 Enjoy your day! That sounds pretty damn good to me! You even have a standing workstation. I’ve been wanting to get one of those for myself. You can easily convert your desk as well. I originally made mine by stacking empty copy paper boxes to prop up everything at different levels… high tier for the monitors, middle tier for paper work (reading/writing), and the lowest surface (desk level) is for the keyboard and mouse. I sat for 19 years before finally doing this. I’ve been standing for 2 years now. A year ago the company re-designed the office and they sprung for adjustable desks; it’s nice but I still needed the 3 tiers (which it didn’t have) so I had to make another set of tiers from another set of boxes. FYI, I bought a drafting stool and use those copy paper boxes as a foot stool for when I want to sit and stretch out my legs. I don’t sit often throughout the day but it is necessary to take a load off sometimes. Compression socks are nice, by the way. Nice. A simple change that can have a major impact on health. Am doing an assisted resting squat in the bus as I’m typing this post. I walk as much as I can. I have a pedometer app and I try my best to hit 10k steps a day. what are your thoughts on squatting instead of sitting? Does it negate the negative effects of sitting and lying down? I have to say I really like your commitment to fitness and the ancestral lifestyle! Squtting is definitely a better option than sitting. For our Paleo ancestors, the deep squat may have been a default resting position (Check out this pic of the Hadza). The best option is of course to get a standing workstation or treadmill desk, thereby dramatically reducing the time you spend sitting on a chair. That being said, personally, as long as I make sure I break up sedentary time with some physical activity, stick to an exercise regimen, and get some walking done every day, I’m not too worried about the dangers of sitting. After all, the goal isn’t to strive for perfection, but to find a plan that works well for you. I don’t think sitting is necessarily bad for us. After all, we humans do have padded behinds for just that purpose. It’s too much sitting and never moving around that’s bad. For those who are disabled and can’t get up and walk, just fidgeting and frequently stretching in the chair is beneficial. There is even a version of Tai Chi for persons who have no choice but to sit. They squat so easily and effortlessly. Hopefully some day I can reach their level. 15k steps/day –> That’s really good! I like the trend: It seems like the standing desk is starting to get more and more popular!